Photo of: West of Ireland: Tipperary: Lough Derg. 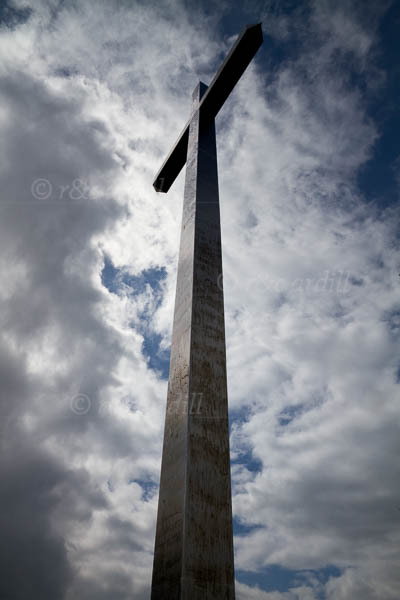 A view of the Millenium Cross near the top of Tountinna Mountain beside Lough Derg. The cross is on a hillock to the north of Tountinna. The hillock is called Knockaunreelyon (Cnocan R1 Laighean or 'Hillock of the king of Leinster'). Near the cross is a tomb, known as the Graves of the Leinstermen. A legend associates this with a bloody dispute between some of Brian Boru's men and some visiting nobles from Leinster, but the tomb is actually prehistoric.